Vlad Namestnikov received the unexpected news earlier this month. 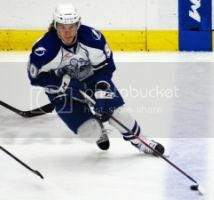 The Syracuse Crunch center went through a range of emotions when he learned he would be making his National Hockey League debut with the Tampa Bay Lightning Feb. 8. During the first 31 games of his sophomore season, Namestnikov accumulated 13 goals and 30 points to earn the look from the Lightning. Despite already eclipsing his rookie season output of 28 points in 62 games, the first step onto the NHL ice seemed imposing. Overmatched Crunch make a game of it. Allen York, back in the crease with Kristers Gudlevskis being recalled to Tampa earlier in the day, allowed 4 goals on 27 shots for the loss. Jon DiSalvatore was the game's second star. The team was without an AHL level goaltender and its top center, arguably, with Vladislav Namestnikov also being recalled earlier in the day. It just continues to be too much of a mountain for the team to climb, unfortunately.